Time to paint some trim! 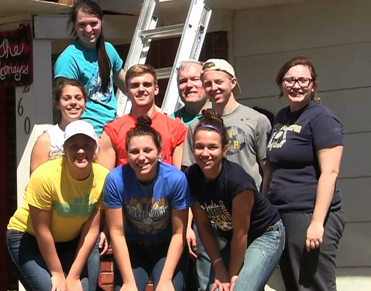 Volunteers from Desoto Leadership scraped paint and painted trim in Ms. Joyce's house. Jake and Emerson tile Joyce’s bathroom. DeSoto Co. Superintendent’s Youth Leadership Council: (L-R) Jake, Cashen, Abbie, Kristina, Madalyn, Zac and Emerson. Badger Catholic: Brigita, Kate, Emma, Quintin and Anthony. Dehon resident, Charlotte, is thrilled with the surprise delivery of fresh produce, pillows and other household items. For the SHSM volunteer program, ‘March Madness’ has finally come to an end. We had a full calendar of willing hands this month. 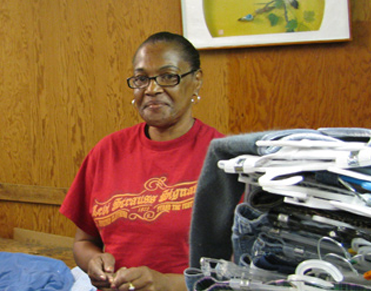 Our clients scored big with every group that came to help us during spring break. From roofs and rafters to tubs and tile, and everything in between, many home rehab projects were checked off our to-do list. The last group of out-of-towners drove more than 10 hours from Madison, Wisconsin. 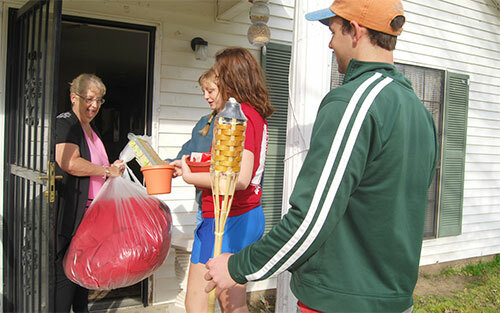 Badger Catholic, from the University of Wisconsin-Madison campus, made the 640-plus mile trip in hopes of helping families in need as well as finding a little bit of warmer weather to offset their hometown’s wintery conditions. Their hopes were illustrated by what they brought to wear — a wardrobe of summer shorts and t-shirts to be worn throughout their time in Mississippi. The Badgers spent most of their week in Nesbit. 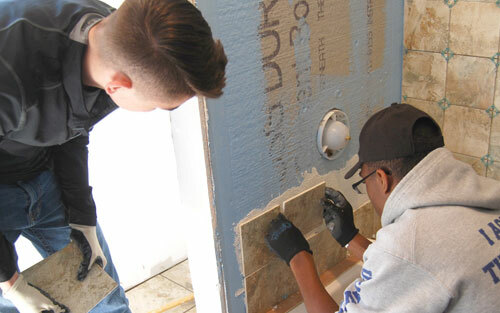 Client Joyce’s home had a number of unfinished projects, which the adventurous crew eagerly tackled. The renovation of the hall bathroom was high on the list. Earlier in the year, the room had been gutted due to the floor giving way. Drywall, a new tub, and tile were first on the list for the Wisconsin team to complete. Work on the outside of the home was also a priority. Fascia and soffit work gave way to the caulking and scraping, as the home was prepped for coats of long overdue exterior paint. Painting of the trim began as the week drew to a close. 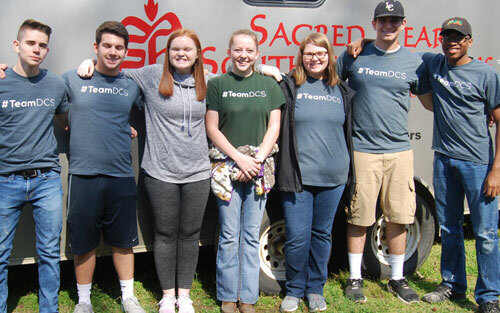 Late in the week, the Badger Catholics received some welcome help, thanks to the volunteers with Leadership DeSoto and the DeSoto County Superintendent’s Youth Leadership Council. 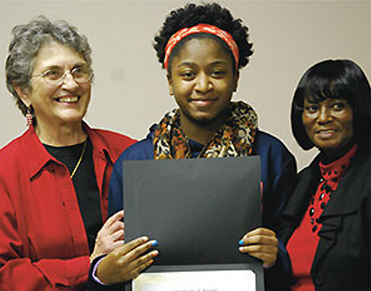 Twelve adults and teens joined the Wisconsin five and together they made quick work of the remaining projects. Besides the home rehab projects, the Badger Catholic team made time to serve at the Garden Café in Holly Springs and also spread some cheer to the residents of Dehon Village. Treats for the neighborhood families included throw pillows, tiki torches, flower pots and seeds, courtesy of the Gift-In-Kind area. An abundance of fresh produce rounded out the surprise deliveries. Residents were thrilled, not only with the unexpected ‘happies,’ but also the warm smiles and kind words from the young people who delivered them. More than 100 volunteers joined us over these few short weeks. 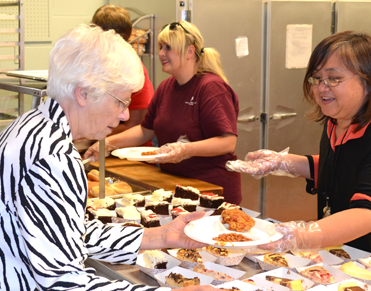 Home repairs, mobile food pantry prep, meals cooked and served, surprise deliveries, tutoring, and a variety of other services have made such a positive impact in the lives of many families in need throughout our service area. Though the parade of back-to-back spring break groups has come to an end, it is by no means the end of the heavy volunteer season. Summer is on the way! Program staff has been busy assessing client homes and preparing for the next large volunteer groups — St. John’s College and Minor Memorial, which are scheduled to arrive just after Easter. Urgent repairs are always on the horizon and new groups are being signed up regularly to help out. 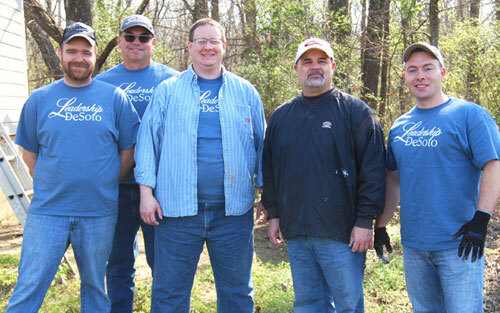 Service Saturdays return later this month, giving locals the opportunity to make a big difference, too.